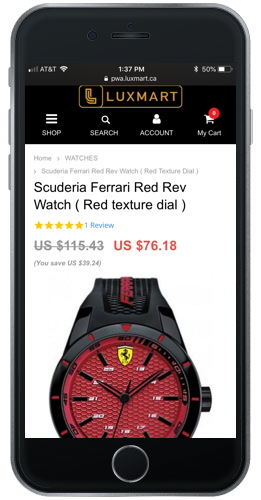 Online retailer Luxmart doubled its mobile conversion rate to 1.24% from 0.6% after introducing a progressive web app (PWA), a technology that delivers app-like experiences to mobile internet users, according to an announcement. Since launching early last month, the PWA helped to optimize push notifications and speed download times on mobile devices, removing a significant source of friction for shoppers. Some days this month have seen conversion rates as high as 3.1%, more than five times higher than before the PWA was deployed. Elie Hantsis, the owner of Luxmart, said in the announcement that the PWA has helped to boost the performance of the company’s mobile site, which had gotten slower as more features were added, causing conversion rates to stagnate at 0.6% for years. Luxmart’s experience with a PWA shows the positive effect of providing mobile shoppers with a website that loads quickly but maintains the same features typically found in apps. That’s especially true in developing markets where many consumers have limited wireless bandwidth and phones that don’t have much storage for a variety of apps. Even in developed markets, requiring customers to take the extra steps of downloading and installing an app can be dissuasive unless marketers provide valuable incentives like loyalty programs, discounts or seamless payment functionalities. Lancô​me, Tinder, Pinterest and FlipKart are among the brands that have also rolled out PWAs to improve the mobile experience for their respective customers. PWAs have several advantages for marketers because they can be updated like a website, avoiding the need to push out frequent app updates to mobile devices, and they don’t require much extra development cost. For shoppers, PWAs not only offer faster browsing, but they also can be bookmarked to the home screen for easier access and a personalized engagement channel. The push notifications, similar to those offered via apps, also allow for rapid repeat access without the need to open the browser and type in a web address as well as quick updates to invite users to return to the site with a single click. While Google is a driving force behind the development of PWAs, rivals like Microsoft are getting on board with the technology to boost their adoption on mobile platforms. Adobe-owned cloud-commerce platform Magento also has created software tools to help marketers build online stores that offer modern app-like experiences. The Magento Progressive Web Applications Studio, introduced in April, this month was integrated with the Adobe Experience Cloud to help small- and medium-sized businesses offer more services to customers and better compete with companies that have large tech and marketing budgets.